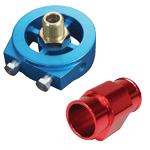 In this section you can find a range of various accessories that can be used with our gauge systems, be it the multi gauge systems or the single gauges. Things such as oil filter sandwich plate adapters so you can easily install Oil temp and pressure senders into your motor, or the water temp adapter fittings which allow you to install in line with your radiator hose to then install a water temp sensor from a gauge system easily. Have you installed an aftermarket ECU in your pre 1995 car and noticed that the tacho signal output ..
Getting a tach signal that can be used with aftermarket gauges on some vehicles can be a problem, a .. Here we have a universal oil filter sandwich plate adapter in silver colour, they are CNC machined a.. These are a high quality stainless steel sandwich plate adapter fitting in 13/16-16-UNF which is use.. These are a high quality stainless steel sandwich plate adapter fitting in 3/4" -16UNF thread which .. These are a high quality stainless steel sandwich plate adapter fitting in M18 x 1.5 which can be us.. Here we have a stainless steel sandwich plate adapter m20 x 1.5 thread fitting, these can be used in.. These are a high quality stainless steel sandwich plate adapter fitting in M22 x 1.5 which can be us.. Here we have an alloy 32mm water temp sensor hose adapter in silver colour, these are used so you ca.. Here we have an alloy 34mm water temp sensor hose adapter in silver colour, these are used so you ca.. Here we have an alloy 36mm water temp sensor hose adapter in silver colour, these are used so you ca.. This is an alloy 38mm water temp sensor hose adapter in silver, these are used so you can neatly ins..